A mixed martial arts fighter dislocated their shoulder after being on the receiving end of a standard spinning kick. The painful incident took place at a Shoot Brasil 90 event in Rio de Janeiro on Friday (March 15), during the bout between Edilceu Alves and Daniel Lacerda. 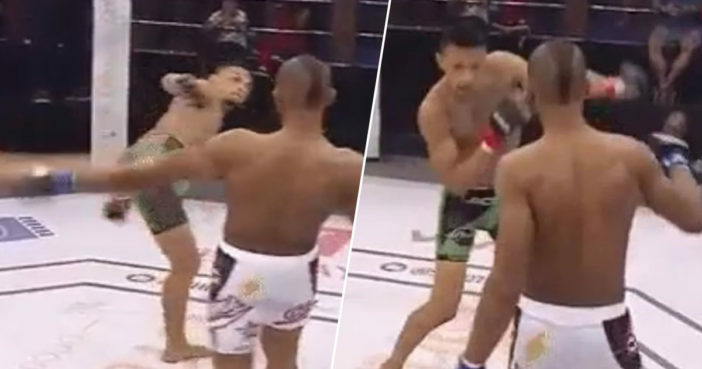 Footage shows 22-year-old ‘Miojo’ Lacerda going in for a spinning kick, and ending up with a dislocated shoulder. The injury resulted in Alves winning a vacant flyweight title in a mere 40 seconds flat. Brazil-born Lacerda’s injury has baffled MMA experts, as the spinning kick itself was pretty standard. I’ve watched this clip about 50 times and I still can’t figure out how he dislocated his shoulder. And you’re talking to a man who has dislocated his shoulder literally hundreds of times. But the shoulder that I would assume is the one he would dislocate is fine! It’s the tucked arm that pops out! His shoulder must’ve been completely nerfed heading into this fight. Imagine if he’d thrown an overhand or something. I bet Lacerda may throw that kick on 50 days and perhaps maybe not replicate this injury. Lacerda isn’t the first fighter this month to end up with a dislocated shoulder. On March 3, UFC fighter Johnny Walker dislocated his shoulder while attempting his trademark ‘worm’ celebration. 26-year-old Walker defeated Misha Cirkunov in an impressive 36 seconds during a Las Vegas bout. Visibly delighted by his victory, Walker saluted the crowd with pride and dropped to the floor, ready to get his worm on. Unfortunately, his celebration was cut short. Walker placed his arms forward during the fall, resulting in him hitting the ground flat on his face, knocking his left shoulder as he went. Ouch. Walker could then be seen clutching his left arm in obvious agony. After being checked over by a medic, it was confirmed Walker’s shoulder had become dislocated during his overly enthusiastic celebration. I’m fine, my shoulder is not too bad, I just need to go do some exams and check to be 100% sure that it was nothing serious. Here’s wishing Lacerda a speedy recovery after his unexpected injury.